Ever since April 30, when the New York Times published a list of topics that special counsel Robert Mueller would like to ask President Trump about, cable news and the political press have focused exclusively on the two major legal matters in which the president is entangled. First, of course, is Mueller's open-ended probe into Russian interference in the 2016 election. Second is the Southern District of New York's investigation into Trump attorney Michael Cohen's business dealings, including with Stephanie Clifford, aka Stormy Daniels. The coverage has been typically sensationalist and hyperbolic. Each new revelation, personnel change, Tweet, and television interview is greeted as a prelude to Trump's defenestration and exile. 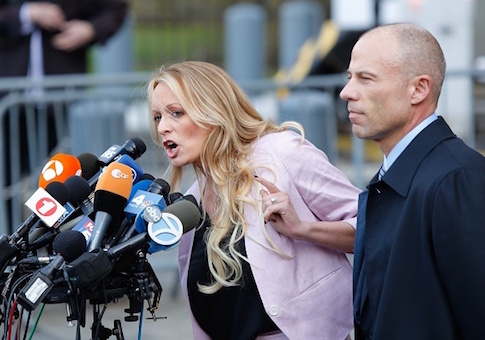 Putin, Mueller, Comey, Stormy, Rudy, and the two Michaels, Cohen and Avenatti—these are the only names that seem to matter in American political discourse. What the Democratic Party has not recognized is that Trump's legal dramas, though good for ratings, have done little to benefit the political opposition. On the contrary: President Trump's approval rating has been on the upswing. He stands at 44 percent approval in the Real Clear Politics average, his highest rating in a year. That number might well be slightly higher, given the existence of "Shy Trump Voters" who are afraid of the stigma attached to approving of the president. Meanwhile, since December, the Democratic advantage on the congressional generic ballot has been cut in half, from plus 13 points to plus 6.5 points. In a new survey, pollsters for Democracy Corps and Women's Voices Women's Vote Action Fund, while optimistic about Democratic chances in the fall, nonetheless concede that the party's "momentum has stalled in the last few months." Why? Well, the most obvious answer is the economy, with its strong job market and positive wage growth. One could also say that voters like peacemakers, and so have embraced President Trump's desire to meet with Kim Jong Un of North Korea. Both explanations sound reasonable to me. But I would also suggest another one: The American electorate has not changed fundamentally in the decades since the Clinton presidency, when in the words of the late Jeffrey Bell it held a "bifurcated view" that separated the man from his policies. And as long as the policies seemed to be working, the man's opponents found themselves wrapped around the axle of personal disgust, waiting in frustration for voters to recognize and repudiate defects of character that were all too plain to see. Trump became president despite majority personal disapproval. His victory depended on a coalition between his devoted fans and more traditional Republican voters who, despite misgivings, supported him because they concluded that the alternative was worse personally and politically. Evaluations of his character are now "priced in" to the electoral market. That is why NBC News/SurveyMonkey found this week that Republicans who say Trump is dishonest support him anyway. And it is why Trump's overall approval in this poll is 45 percent, "tied with the highest rate of approval recorded by the NBC News/ Survey Monkey poll since he began his presidency." The incessant spotlight on the lawyers, on their clients and subjects and targets, not only occupies the attention of Democrats and the anti-Trump Resistance to the exclusion of other topics. It also relieves them of any responsibility to come up with a substantive message. The voters, by contrast, read the headlines with a cursory or prurient interest as they go about their lives in the real world of work, family, community, and faith. One voter told me the other day that legal terminology makes her eyes glaze over; she'd much rather browse Instagram. But such terminology is all anyone speaks in Washington nowadays—even if most pundits are not lawyers, probably couldn't get into law school, and make up for their lack of expertise and inside knowledge with hyperbole and speculation. "In the past few months," write the authors of the Democracy Corps poll, "Democrats have appeared less focused on the economic and health care battles that most engage anti-Trump voters; at the same time, Republican base voters, especially white working class men, could finally point to a signature conservative policy achievement in the new tax cut law, where before they were grasping for news to justify their vote." Is it any wonder that Democrats appear less focused on the issues that engage voters, when the most prominent spokesmen for the party are Adam Schiff and his mannequins on the House Intelligence Committee, and Richard Blumenthal and Ron Wyden on the Senate side? When Michael Avenatti is on television to such an extent that by the end of this process he won't just have his own show, but probably his own network? I take exception with Democracy Corps' analysis on one point. The tax bill passed in December, yet Trump's approval began its most recent rise in March. That is exactly when he announced, against the wishes of his some of his own advisers and the Republican Congress, his first round of steel and aluminum tariffs. It is Trump's desire to combat offshoring and deindustrialization, more than the tax bill, which is galvanizing his base and strengthening his economic message. More even than immigration, trade and manufacturing were the issues that distinguished Trump from elites in both parties and won him a mass majority of white voters without college degrees. College-educated voters and suburban women disgusted with Trump may be enough to win the Democrats a slim House majority. But Democrats won't find themselves in a truly commanding position until they make inroads among the Rust Belt voters who abandoned Hillary Clinton for the president. The more the party focuses on Robert Mueller and Stormy Daniels, the less likely it is to recognize the appeal of Trump's economic message and to adjust accordingly. The more the party falls for the self-flattery, empty rhetoric, question begging, and maze-like complexity of media narratives—not to mention the more it succumbs to the fever-dream of impeachment—the less likely it is to recoup the power it once enjoyed. This entry was posted in Columns and tagged Democratic Party, Donald Trump, Media, Robert Mueller, Social Media. Bookmark the permalink.